Your brain is your most important and complex organ you have. Stress, emotions, exposure to environmental factors, diet and lack of proper nutrition can all take a toll on your brain every day of your life. These stresses can affect the way your brain works. But when that happens, most people brush it off as “just growing older”. Your brain function can naturally decline around the age of 40. Researchers today tell us a decline in brain function is not necessarily an inevitable part of growing older. Rather, there’s much you can do to help promote optimal brain function as you age. 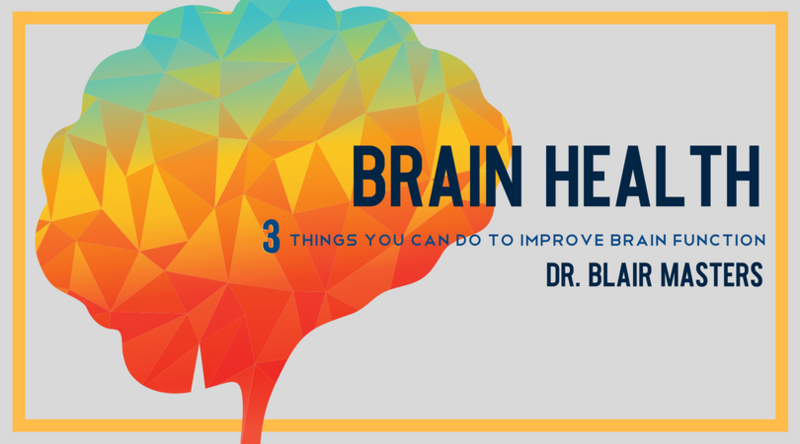 3 Things You Can Do To Improve Brain Function. I believe there is much you can do to help maintain optimal brain function. Just like function loss, it takes time however. And it takes persistent effort. So the best thing is to change your lifestyle so that it (your lifestyle) promotes health and does not promote disease or dysfunction. Exercising regularly. Exercise is a great promoter of brain function. Especially exercise that requires you to use your brain. Walking in the woods, dancing, etc. Fine-tuning your diet. Make sure that your diet is low in Omega 6 fatty acids and high in Omega 3’s. This is fundamental. There are many more things you can do for your brain diet wise. If you or someone you know is having problems, give us a call. If you are interested in learning more of what you can do for your overall health and brain health, give us a call at (479) 443-0800 or click here to schedule a FREE consultation.